As temperatures drop, pet owners need to increase their cold-weather smarts! The East Bay SPCA would like to remind pet guardians to practice our cold weather tips to help keep animals warm and dry. As temperatures drop, pet owners need to increase their cold-weather smarts! The East Bay SPCA would like to remind pet guardians to practice its cold weather pet tips to help keep animals warm and dry! 1. Make sure your pet is dry. Whether coming in from the rain after a potty break, or just after a bath, be sure to thoroughly dry your animal. Wet paws can lead to matting of the hair around the feet, and wet pets can get the chills! 2. Beware, outdoor cats sometimes sleep under the hoods of cars. When the engine is started, cats can be injured or killed by the fan belt or other machinery. If there are outdoor or feral cats in your area, bang loudly on the car hood before starting the engine to give stowaway cats the chance to escape. 3. If your dog is sensitive to the cold due to age, hair length or a medical condition such as arthritis, consider getting him/her a sweater or jacket. You will want to choose clothing that is designed well and not too tight. If your dog becomes stressed wearing the attire, don’t force it! You can also take him/her on shorter walks to relieve discomfort of being in the cold or rain. 4. Some dogs dislike the rain and will avoid house training. Just like people, different dogs have different reactions to rainy weather. Some dogs revel in the water while it is difficult to get others outside. 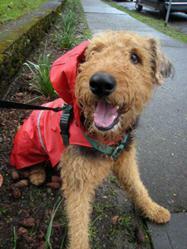 For the latter, consider a rain jacket or taking your pup on short walks with an umbrella. Also remember to give a lot of praise to remind your dog that going to the bathroom outside is a good thing! 5. Offer your dog plenty of enrichment! If you and your dog are not able to take long walks or get as much exercise due to the cold or rain, make sure you set aside extra time for play and enrichment. Enrichment is providing challenging and fun toys, games, and activities. It might be a good time to practice some training skills! Felines can also partake in enrichment through activities including hide-and-seek with treats, mentally stimulating toys, and more! Stronger bonds between you and your companion will improve their physical and emotional health as well as your own! The East Bay SPCA (EBSPCA) is a 501(c) 3 non profit committed to the welfare of cats and dogs in Alameda and Contra Costa Counties. We strive to eliminate animal cruelty, neglect and overpopulation by providing programs and education that support people and companion animals. We operate two adoption centers and two spay/neuter centers in Oakland and Dublin. We also offer dog training classes and humane education programs at both locations and provide a full-service veterinary clinic at our Oakland location. Additionally, we offer dog boarding at our Dublin location. The East Bay SPCA is one of the nation’s oldest humane organizations, in operation since 1874, and receives no funding from any national organizations. More information about EBSPCA can be found at http://www.eastbayspca.org or by calling 510.569.0702.